Enjoy fireworks, concerts and other family-friendly entertainment around the Tidal Basin and National Mall during the 2018 National Cherry Blossom Festival. Check out this year's highlights. WASHINGTON — The parade is just one of several can’t-miss events during the annual National Cherry Blossom Festival. Enjoy fireworks, concerts and other family-friendly entertainment around the Tidal Basin and National Mall. Below are some notable highlights. The event will feature traditional and contemporary performances by singer T.M.Revolution, Japanese drummers Miyako Taiko, the 6821 Quintet and more. Enjoy delicious food highlighting D.C.’s culinary scene, an open bar, “unique” entertainment and a silent auction. This celebration of Japanese culture features music and dance performances, face painting and cherry-blossom-themed crafts. Enjoy Japanese drumming and dance performances. For more information, check out the festival’s official page. 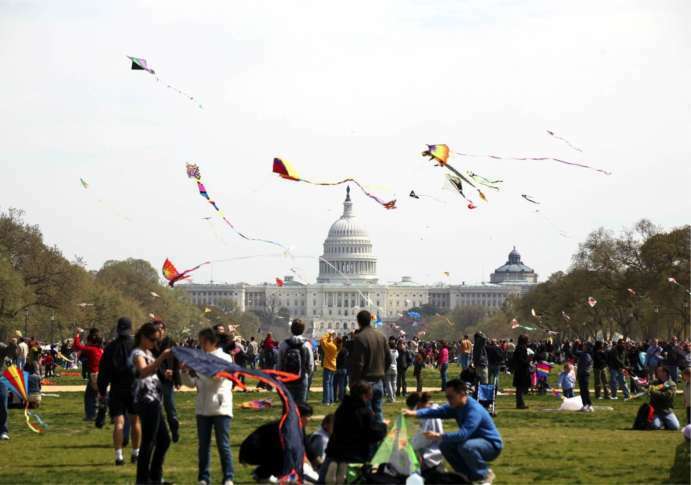 Watch colorful kites soar above the cherry blossoms. Bring your own kite or buy one. Children can also make their own at an activity station and there will be “pet comfort services,” including waste bag distribution, treats, and water stations using bowls with potable water. Competitions and demonstrations are also planned. Formerly known as the Southwest Waterfront Fireworks Festival, Petalpalooza features interactive art installations, games and activities, live music, an 8:30 p.m. fireworks show (weather permitting) and more. Pets comfort services will be provided again (waste bag distribution, treats, and water stations using bowls with potable water), as well as a chance to meet to adoptable dogs from the Humane Rescue Alliance from 1 p.m. to 4 p.m. The event is free, but $20 tickets to the grandstand are available. See more on the festival page. Read more about road closures here. For other daily activities, check out the Events and Activities page. Beat the crowds and bring your flashlight for a 1.8 mile, two-hour guided walk around the Tidal Basins. Take a 3.5 mile jog with a park ranger under the beauty of the cherry trees. Bring your bike and take a leisurely, three-hour ride beneath the blossoms. Enjoy a two-hour stroll among the cherry blossoms with your favorite furry friend. Bring your binoculars to see the birds among the blossoms.